Click the Gallery link in the upper right near the Search button. 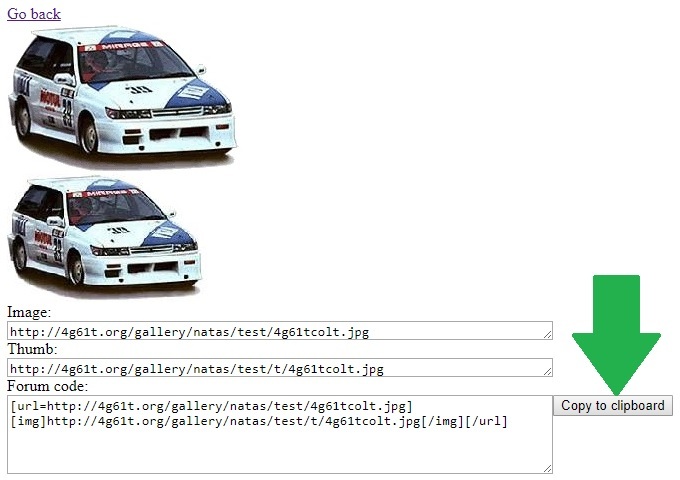 The Gallery viewer will be displayed. Click the 'Edit Your Gallery' button in the upper left near logout. 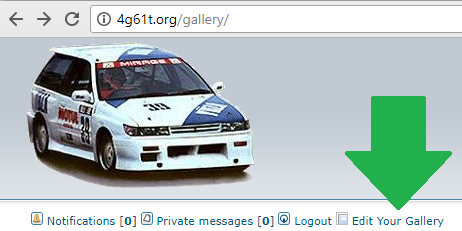 You must be signed in to forum/gallery to see this button. Forum and gallery use the same username and password. 1.Select a folder to upload an image to. (An 'images' folder is available by default, folders can be created). 2.Press the 'Choose File' button to browse to a 5MB or smaller jpg, png or gif image. 3.Press the upload image button to upload the image. 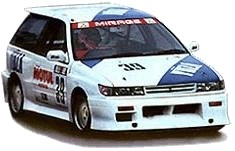 The uploaded image will be displayed along with its thumbnail, links to the images and forum code. Press the 'Copy to clipboard' button to copy the forum code to your clipboard. Paste the forum code into your post. Please report any issues here or PM me directly. Edit: Some .PNG may have error on import, clicking on the blank thumbnail will generate it. If I understand correctly, uploading images this way will have them hosted from 4g61t.org, reducing the incidence of broken image links. Do I have that correct? I've had years' of image links broken on my most frequented motorcycle forum when the separate image hosting site did some minor reorganization. Hosting from 4g61t.org seems to me the way to go, and I had missed that we could do this. I appreciate your taking the time to make this tutorial! You got it. I am glad to be able to give something back to the community. The gallery is still a work in progress but it is long overdue, open to any suggestions to improve it. That's exactly right, I am sick of broken images too! 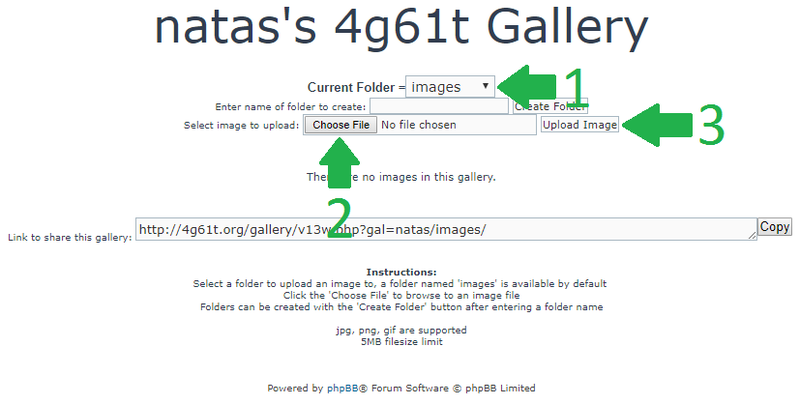 Images can now be uploaded and hosted at 4g61t.org. This internal gallery should make it so there are no more broken images in the posts here in the future, as long as they are hosted here of course. The images can be included in posts here and accessed directly from their address, hotlinking from other sites isn't currently allowed. You didn't miss out on it, it was being tested by the moderators but is now open to everyone. hi, im just wondering if there is a way to delete pics from our galleries? Sorry for not updating the gallery yet, deleting is not available but it is planned to be added. PM me a link to any images that you want deleted. hello, i seem to be having trouble uploading pictures from my computer to my gallery. i browse for them and then hit "upload". Also if its all working normally do you actually have to upload one image at a time? you cant highlight and take a group of pictures in at once to a folder? A problem with the server host preventing images from being uploaded in the last 24 hours has been resolved. Thanks for using the gallery and letting us know, sorry for the trouble. Right now only a single image can be uploaded at a time, the ability to upload multiple images and rename/delete hasn't been added yet. If you have lots to upload I can give you an FTP password to your gallery folder or you can email them to me at and I will add them.